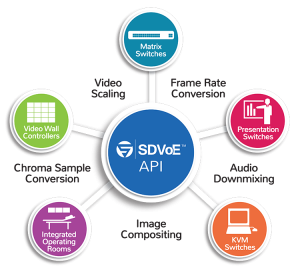 The technology that underlies all SDVoE products is the same – the SDVoE API, SDVoE clock resynchronization and SDVoE session management. This ensures that devices from different manufacturers are interoperable by design. AV traffic, as well as control, pass seamlessly from one to any other, and the unified API allows software built on the SDVoE platform to control all functions of any SDVoE core hardware. As with any application platform, some application developers may target specific hardware with specialty capabilities and choose to “lock” their application to a particular subset of SDVoE devices. This practice is neither endorsed nor prevented by the alliance.